Members of the fledgling Chem-E-Car team at the University of Rochester went head to head against powerhouse teams from Cornell and McGill at their first-ever regional competition last month. “Honestly, just getting to the competition and passing the safety component—we were ecstatic,” says Elizabeth Mauser ’17, who, with fellow senior Reyna Juarez Martinez, began organizing the team in earnest just last school year. Safety is paramount—and stringently enforced—at the competitions sponsored by the American Institute of Chemical Engineers (AIChE). 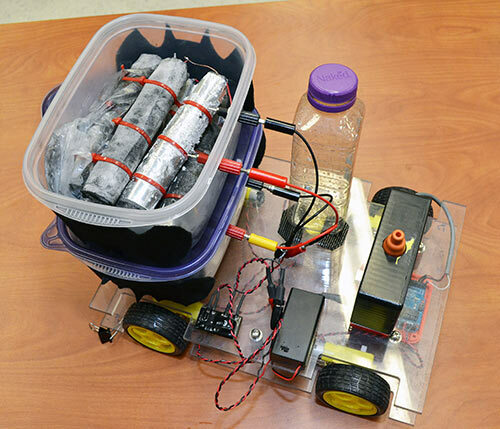 The events feature vehicles students build from scratch, powered by chemical reactions. Teams are given two attempts to deliver a load of water as close as possible to a distance determined an hour before the competition begins. 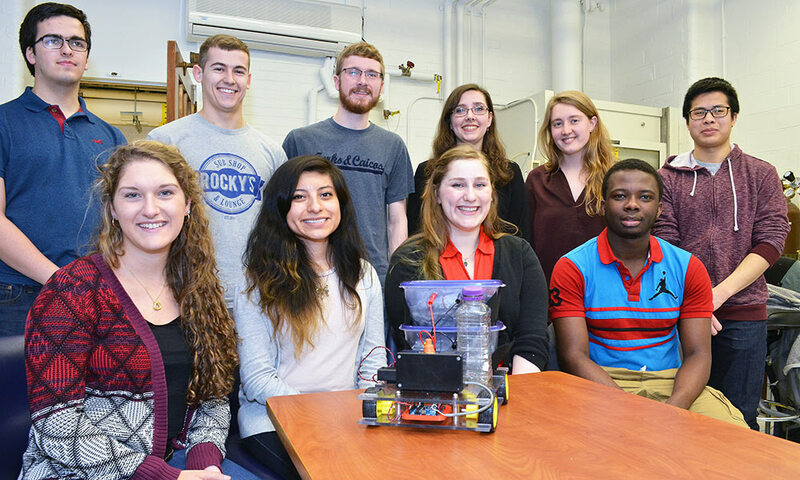 The chemical engineering students, all members of the University’s AIChE student chapter, finished tied for 11th place among 13 qualifying teams in the March 26 event at Worchester Polytechnic Institute in Massachusetts. That was ultimately the team’s undoing when the competition got under way. The Rochester students were the first to the start line. Alas, they couldn’t get their vehicle to move. “We just needed a little more power . . . Just a few extra cells and it would have started moving,” Lamothe says. They recognize that the competition was part of a learning curve that began just over a year ago, when Mauser and Juarez Martinez were the team’s only members, struggling to master car design and safety procedures. The team’s spirit showed. Unlike some of the other teams, they didn’t have big corporate sponsors or funding. But the judges “said we were most enthusiastic team,” says Melissa Becker ’17. Team members say they’re grateful for the advice and support they received from faculty and staff within the Department of Chemical Engineering. Next year, they’ll encourage students from other departments such as mechanical engineering and electrical and computer engineering to lend their expertise. Of the 11 members who coalesced this year, all six non-graduating students plan to continue the team in fall 2017. Next year, they have no intentions of being stuck at the starting line. « Birthday bash fit for a president. The third, actually.